When The Metropolitan Museum of Art hosts an exhibition of early American art, it is by definition an important moment for our field because of the institution’s enviable success at drawing a broad audience to its shows. When that museum uses its considerable clout to gather major international loans that tell a fuller story than any previous exhibition has been able to do of the transatlantic existence of one of the most influential of American artists, it is only more so. Thomas Cole’s Journey: Atlantic Crossings marks a turning point for early American art in the popular consciousness, both at home and abroad, by challenging the nativism and conservatism that surrounds narratives of that most marketable and yet most fraught of Americanist brand names: “Hudson River School.” In so doing, it contributes to a moment of transatlantic American landscape exhibitions such as the Detroit Institute of Arts’ Frederic Church: A Painter’s Pilgrimage1 and my own institution’s recent The Rockies and the Alps: Bierstadt, Calame, and the Romance of the Mountains.2 The editors of Panorama asked me, as a nearby Cole specialist with a keen interest in this project but not a participant in it, to interview the cocurators for the benefit of the journal’s readership. In combination with the accompanying review by David Brody of the London installation of the exhibition, this perspective on the process and goals that made Thomas Cole’s Journey will, it is hoped, offer insights equally applicable to future museum efforts in this direction and to colleagues on the academic side contemplating modes of bringing scholarly insights to larger audiences by collaborating with museums. I spoke with co-curators Betsy Kornhauser [Alice Pratt Brown Curator of American Paintings and Sculpture at The Met] immediately after the Scholars’ Day that marked the closing of the exhibition, and Tim Barringer [Paul Mellon Professor in the History of Art, Yale University] sent responses to questions a few weeks later via email. An edited transcript of our conversations follows, along with select images from the Scholars’ Day. Fig. 2. Betsy Kornhauser addresses the group at Scholar’s Day, with Shannon Vittoria looking on. 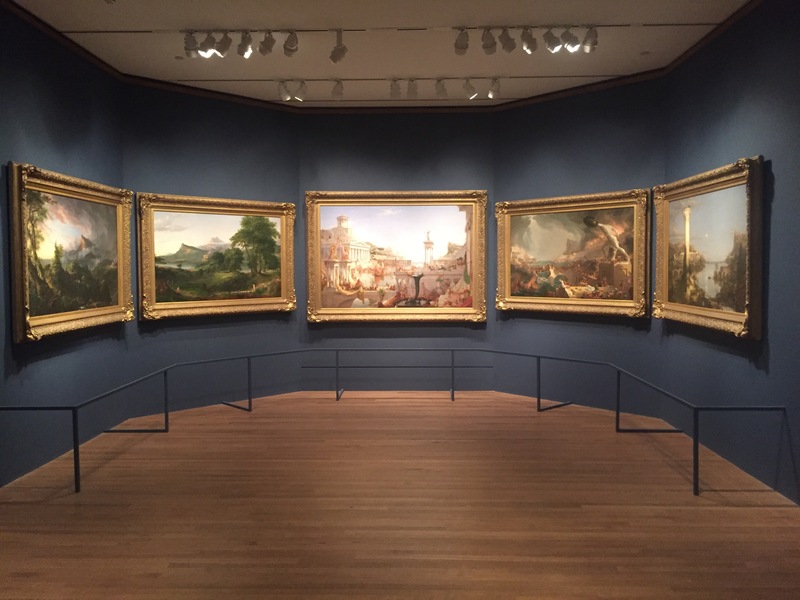 WLC: Thank you for agreeing to share some insight into Thomas Cole’s Journey with the readers of Panorama that goes beyond the usual perspective of an exhibition review. First, what was the genesis of this exhibition? Why Cole, and why now? TB: Trans-regional approaches to art history and the idea of the Atlantic as a space of intercultural exchange demand new readings of an artist hitherto firmly rooted in outmoded nationalist approaches to art history. Cole is the perfect example of a figure who crossed borders and boundaries. His concern with the environment also resonates vividly with contemporary preoccupations. 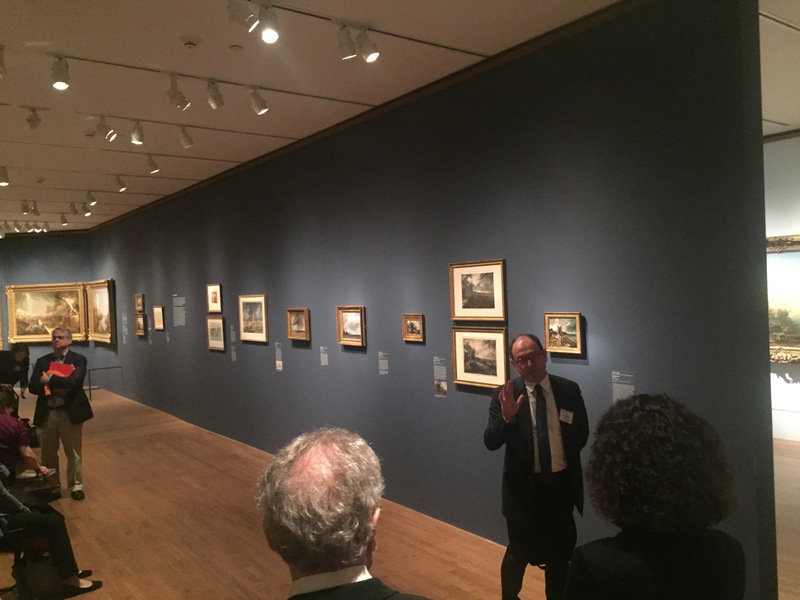 I was J. Clawson Mills Fellow in the American Wing at The Met during a sabbatical in 2013–14, and really enjoyed discussing ideas about transatlantic exchange with colleagues, notably Betsy Kornhauser. We considered borrowing just two works—one each by [Joseph Mallord William] Turner and [John] Constable—to juxtapose with Cole’s Oxbow, as an experimental intervention in the permanent collection. But when that proved unfeasible, we moved on to curate together a major exhibition exploring the formative aspects of Cole’s Atlantic travels. 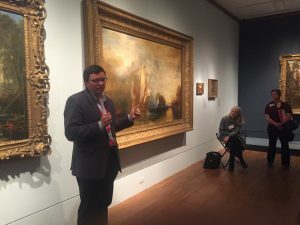 I’d written an essay on “The Englishness of Thomas Cole” in 2011,3 emphasizing the transatlantic dimensions of Cole’s identity, but of course had never imagined the possibility of expanding those ideas, in collaboration with colleagues, into a major exhibition with the kind of loans only The Met can secure. The Italian aspects of the exhibition, and the technical art history that plays so important a role, were brought to the project by [curator] Betsy Kornhauser, research assistant Shannon Vittoria, and senior conservator at The Met, Dorothy Mahon. BK: Tim and I had been colleagues when I was at the Wadsworth Atheneum and, as you know, he has been at Yale. Because of the great historic collections [of the Wadsworth], I was very interested in getting works by the Hudson River School to other countries. So I did a series of shows comparing Australian and nineteenth-century American landscape.4 I did a show that toured through Germany, starting in Hamburg, where we engaged German scholars.5 So my publications were out there, and Tim was on the other side, looking from his knowledge of British art—“The Englishness of Thomas Cole,” and he cocurated American Sublime in London6—so when he came here for a fellowship, we were already friends. Honestly, I can remember this moment standing in the Hudson River gallery, looking at The Oxbow [View from Mount Holyoke, Northampton, Massachusetts, After a Thunderstorm—The Oxbow; 1836] and having this conversation about how we felt that for whatever reason it had been overlooked in exhibition formats, mainly because The Met would rarely lend it. Right at that time, I was able to buy the oil study for it, and that started this conversation. Tim mentioned that the Yale Center for British Art was closing for renovations and they have all these wonderful British precedents for Cole’s work. He suggested that we do a small show at the British Art Center. Well, I have never done a small show in my life! Once we started thinking about it, it just blew up. We started thinking about his Italian career. I started gaining knowledge about the new discipline of ecocriticism and trying to plug Cole into that. And then I got a fellowship at the American Academy in Rome, and Shannon [Vittoria] was able to come over, and we really exploded open the importance of his Italian Grand Tour. It suddenly provided a strong balance to Tim’s exploration of Cole’s boyhood and later time in London. So it made the story much richer; Italy just snapped it all into place. We worked as a team, which I think really helped a lot. We would go on these trips together, so we were bouncing ideas off each other. It was just a long process. When we went to Detroit, all three of us went and looked at all of the drawings together. Very often museums will say, “Well, why do you all have to go? It costs so much money.” But we just did it and we made sure to have scholars like Alan [Wallach] in the background to bounce ideas off of. WLC: How did the National Gallery in London come to be involved? BK: Once the National Gallery signed on and Chris Riopelle [Curator of Post-1800 Paintings, National Gallery of Art, London] got involved, then it really became a full-out show. Number one, we were deeply emphasizing Cole’s British roots. It has always been my habit to send American painting shows to Europe. I feel like that’s a very important mission: to de-nationalize American art and to develop an international interest in American art. American art is distinguished, not in a good way, for the fact that it’s not collected by other nations, and that’s a problem. In order for the field to flourish, we have to have international stature. I started this way back in my early career, and with the Terra Foundation we’re starting to make serious headway. It would have been a disaster, I think, for us to do this show only in the United States. We need that English side to say “This is amazing, Cole is amazing.” I should also say that [director of the National Gallery] Gabriele Finaldi was a huge fan and completely embraced the show. WLC: What surprises and challenges emerged during the process? TB: The surprise, for me, was the fact that almost every single loan request was met with a positive response, although credit for that must go to Betsy Kornhauser, a virtuoso curator with many successful loan exhibitions to her credit. There was some discussion about whether the Wolf galleries in the American Wing were too small for the exhibition, but working closely with Brian Butterfield, The Met’s brilliant designer, we were able to produce an installation that allowed all the intended juxtapositions their full effect. BK: When my exhibition space was changed on me—that was unfortunate—we had to be very disciplined about our selections. But, I think in the end, it probably made it a better show because a lot of the public enjoy the size of it. It’s like every single painting plays three or four different roles, and if you remove it you remove part of our storyline. So it was that tight a selection. There are always these ups and downs. I had had a lot of experience organizing shows because I ran the exhibition program at the Wadsworth. You have to have administrative skills to pull it off. In a big place like The Met, you have to be able to gain the interest of every single support department in the Museum, or else you’re going to get overlooked or put at the bottom of the pile. Basically, it’s a matter of selling your project: you have to sell it to the director, you have to sell it to the exhibition committee, you have to sell it to development so they help you to fundraise, sell it to the communications department, corporate sponsors, [and] foundations. A lot of that is what I do well because I had been a deputy director/chief curator at the Wadsworth. At The Met, you need advanced skills to rise above all the other projects that curators want to have happen. WLC: What did you learn from conservation science and how did these findings impact the exhibition? TB: Working closely with Dorothy Mahon, we examined The Oxbow and Consummation of Empire, two canvases of near identical size, and made a close analysis of the underdrawing of the former. As Dorothy’s essay in the catalogue, and the digital graphics on display in the show, reveal, an early compositional study for Consummation lies under The Oxbow. Thanks to research for the show, we now understand Cole’s technique much better. But from my point of view, the most compelling result was a new interpretation of The Oxbow. Often the work is seen as an endorsement of the expansion of agriculture in America, a “pastoral state,” or even an “American Paradise.” But now we know that Cole’s ostensibly beatific vision of farmland expanding into the wilderness was painted directly over the top of a composition offering a harsher presentation of industrial development, empire, greed, and violence. In a juxtaposition between the layers of paint and graphite are enshrined the stages of history that Cole had seen played out in industrial Lancashire—and The Oxbow is revealed as a dire premonition about America’s future. BK: We had certain hypotheses. Because I’m married to a painting conservator [Stephen Kornhauser, Chief Conservator of the New-York Historical Society] and I spent my life with a painting conservator, I kept looking at the right side of The Oxbow—that it’s a sunlit, fertile valley—and no, it’s not. It’s painted completely differently and it’s not Arcadia. This prompted an extraordinary technical study that took a whole summer. Tim and I became obsessed with Consummation and The Oxbow because they’re the same size, Cole painted them at the same time, he deeply struggled with Consummation but painted The Oxbow in six weeks. The Met has a state-of-the-art conservation department with a brand-new infrared reflectography machine that had the ability to go deep below the surface. We were able to get Consummation over here two summers ago for a whole summer. Dorothy examined the two paintings side by side in every which way that you could do. We did paint samples to determine the grounds, samples where she proved the pigments he used were very new and novel, ahead of their time. We did X-rays, we did infrared, which was the first time the full underdrawing for Consummation that he did just as a test run was revealed under The Oxbow. That completely verified my thesis about the right side, when he’s doing those minute rows of corn, and knowing that underneath are the carefully ruled lines of the architecture. It just made sense. We made tremendous discoveries: the lurid orangish vermillion ground for Consummation that Ed Ruscha said that Cole wanted you to be horrified by and the lovely pinkish hue of the New England Oxbow landscape as the ground. All of our theories were verified by those discoveries. In the catalogue, I write about The Oxbow from a curatorial perspective and Dorothy from a more technical perspective. WLC: Participants in the Scholars’ Day were struck by the connection drawn to our current political circumstances and by the effort to redeem Cole’s own politics. How do you deal with the challenge of studying and sharing an artist whose work was shaped by a politico-religious value system that may conflict in many respects with your own? TB: Two separate questions here. (1) There were undoubtedly very vivid parallels between the political circumstances of the 1830s, as Cole saw them, and those of our own day. Cole loathed Andrew Jackson, the populist and expansionist president who has been singled out by the Trump administration for approbation. Cole’s nightmare vision of “Consummation of Empire” bears close comparison with the swaggering, imperialistic vision of America articulated by the present regime. And most of all, Cole’s horror at the depredation and despoliation of the natural world in the search for short-term profit, the economics of extraction, finds close parallels with contemporary resistance to the planned removal of restrictions on practices like fracking and drilling in the Arctic. While Cole’s solutions to political problems—a return to the deferential social hierarchies of the past—have no place in 2018, his analysis of the dangers of unplanned growth and unchecked capitalism seem more relevant than ever. BK: [In] the retrospective that Alan [Wallach] and Bill [Truettner] did, they broke so much new ground.8 I think Alan is just the most amazing person, but I feel like that showed everything Cole had ever done, and someone needed to do that show, but in the end you think of him as a highly conservative artist, looking back in time. What we discovered was how progressive his artistic career was. I ended my essay with a discussion about his incredible embrace of the new medium of photography. Anytime a new artistic discovery is made, whether it’s a new pigment or the technique of plein-air oil study, Cole grabs onto it in a progressive manner, whereas he wants the New World of the United States to stay in place. He doesn’t want the landscape to be altered, he doesn’t want industry to take over, he doesn’t want deforestation. It’s kind of a push-pull. I wanted to prove that Cole was a great intellect. We were blown away by the writings of Thomas Cole. Tim has a reputation for engaging social history, and I feel like in my own work I’ve done that as well. Just as Alan did quite well in his own show in 1994, presenting the Jacksonian era as a backdrop for Cole, we took it a few steps further by positioning Cole against the dramatic transition of industrial horror in England as his childhood backdrop and then later on showing him against the history of Rome and then the building up of the British Empire and then his return to the second term of Andrew Jackson. He rails against Jackson in his journals. It’s important to note we were plotting all this when we thought a Democrat would be the next president. We had no idea it was going to be Trump. And so we had already inserted a semipolitical storyline into our work, but we thought we were being subtle. As curators, we don’t allow ourselves to take strong political positions. We prided ourselves in this show with Shannon fact-checking every quote, Alan also: everything said was based on Cole’s voice. We weren’t making this up; it was all there. We were just incredibly lucky in some ways that Trump got into office, and in other ways, not. WLC: Betsy, you put together some unusual public programs in relation to this exhibition. Many readers of Panorama will be shocked and delighted to hear that Sting and Ed Ruscha are even interested in this dusty old stuff. How did you get their participation in your events around the show? BK: I’m a friend of [contemporary realist painter] Stephen Hannock, and Hannock is one of Sting’s best friends. Stephen explained to me the project they had done together about Sting’s childhood in Newcastle, where the shipping industry was destroyed by globalization—his father worked in the shipyard, and Sting was going to have to work in the shipyard. A couple of years ago, Sting did a Broadway show where he wrote all the lyrics, and it’s a story that’s very evocative of Cole’s own story. I worked with Stephen; it took probably about a year and a half to make all this happen. I was determined to get Sting as the voice of our video, because we wanted our audiences to understand the British roots of Cole. It was important for us to signal up front by using a northern British–accented voice, and having a famous voice didn’t hurt either. Years ago I remember stumbling upon Ed Ruscha’s Course of Empire, the two versions that were shown at the Whitney after they had been on display at the Venice Biennale, and I was knocked out by them, but I was frustrated because you need to see them in conjunction with Cole’s Course of Empire. I love Ed Ruscha’s work and was determined to get him here, but I was told it would be impossible. What I finally did was to find his oldest and dearest friend Bob Monk [a director of the Gagosian Gallery]. Once I found him and explained my desire, he really helped me, and he got me a visit out to meet with Ed. Ed has a lot of watchdogs around him, so I had to demonstrate my knowledge, etc., and they were suitably impressed and finally agreed to a conversation in our theater here. I had wanted to show [Ruscha’s] Course of Empire series here, but it was a difficult year at The Met—we were without a director—so I put a bee in Chris Riopelle’s bonnet. I said “Look, I can’t do this but there’s nothing stopping you from trying.” And so he actually managed to pull it off. They’re really co-marketing Ed Ruscha and Cole together. For them, in England, Cole is an unknown artist, so they needed a hook: two great American artists, one with British roots, will bring them a bigger audience. WLC: It’s something that we see happening not infrequently, especially in American art, perhaps more than in other disciplines, that some of the most important scholarship, the most important ideas, have always come out of museums as much as universities. I’d be interested to hear more about that relationship, how you see museums relating to scholarly discourse. What are the advantages and disadvantages of exhibitions as a scholarly enterprise in comparison to academic writing and teaching? What is the role of the exhibition catalogue in all this? TB: Exhibitions certainly involve more compromise than a single-author book or journal article, but the advantage of an exhibition is, of course, the visceral experience of works of art in juxtaposition. About 170 thousand people saw the Cole show at The Met, and I hope many of them saw him afresh in the light of his Atlantic crossings. An academic publication can only reach a tiny fraction of that number of people; the exhibition catalogue is fast becoming the most widely read form of art-historical writing. The disadvantage of museum work is that complex theoretical and historical problems sometimes have to be simplified. The Met values and supports research and documentation very highly; unfortunately this is not true of all museums. The project was conceived as an exhibition, and its points are ultimately visual ones. The catalogue stands alone as a book—strongly argued, lavishly illustrated, supported with scholarly apparatus of catalogue entries, footnotes, and bibliography—but in the end, it is the argument of the show that matters most. The juxtaposition of works by Cole with the paintings he saw in London—great works of Turner, Constable and Claude [Lorrain]—will never be achieved again. It is the sheer visual power of seeing Turner’s Hannibal in the same room as Cole’s Consummation that validates the entire project. BK: I have an entire history of collaborating with academic colleagues. One of the things that I admit and celebrate is that very often curators are deeply inspired by cutting-edge scholarship by our academic colleagues: you are moved by the idea and immediately start thinking of it in visual terms. [In museums] we want to create a visual story for the general public that tells that very heady, academic point, or makes many of them. That’s precisely what Tim and I did. He has sabbaticals, which I do not have. He has time to read more deeply in many ways. I have more time to study the paintings, so I’m very interested in what my technical studies tell me about art. There have been several really groundbreaking new essays on Cole in recent times that I have been very impressed with, so we took those ideas and find just the right paintings to find those stories. We don’t gather the paintings and apply our thesis idea. We take the new scholarship and find what we believe to be the best examples. Then, in the process, we learn so much more that’s new from the gathering of these paintings. We believe the success of any exhibition is if the viewer can capture your complex ideas visually: don’t read the labels the first time you go through. We want you to get these ideas from the visual study of the paintings, and then go back and read and get the detail. I always like to partner with an academic colleague who’s very plugged in to that world, whereas I’m plugged in to other worlds: I work with conservators, I understand the audience, I can assess a painting in a really deep way in terms of condition, all that kind of visual exercise is what curators do. I believe one cannot work without the other. 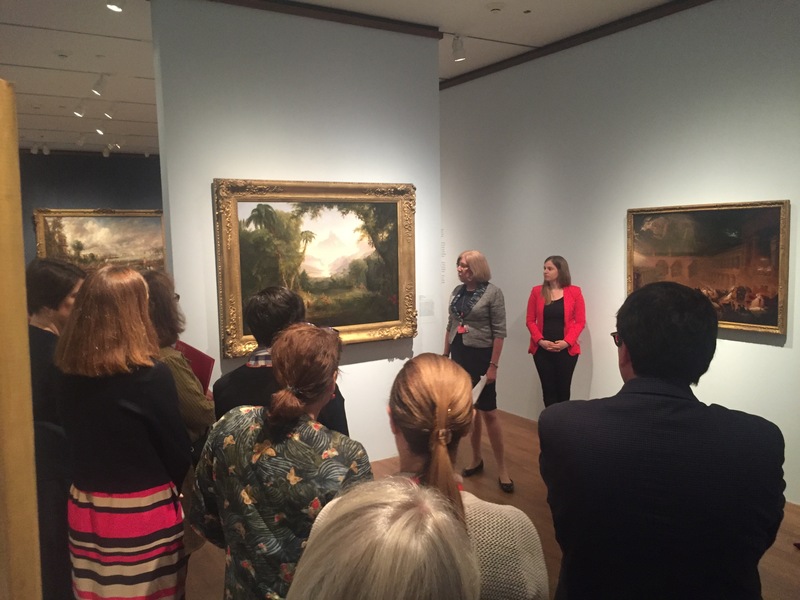 WLC: How do you hope this project will advance the study of American art? What new research directions or ways of thinking does it open in your view? TB: I hope that American art will finally be considered in relation to a wider world. Nationalism still defines and bedevils the field, despite many earlier attempts to present American art in trans-regional contexts. The idea of migrancy and displacement is a rich theme for further development. Concepts of art and empire have not been fully explored in relation to each other. Finally, I hope that we have done something to displace one of the most destructive, but most dominant fictions, in the historiography: the “Hudson River School.” This retrospective label was applied by detractors of American landscape painting to make it seem provincial and irrelevant. [Frederic] Church in Ecuador, Cole in Italy, [Martin Johnson] Heade in Brazil, [Albert] Bierstadt at Yosemite—these have nothing to do with the Hudson River, and the term serves to marginalize American art from bigger discourses and conversations. BK: When we set out to explore Cole’s journey, we honestly didn’t know what we’d find. I feel like all of our suspicions have come true: that his tours of England and Italy were unbelievably rich and important. I have posed the question, “Had Cole not had his early British roots, had he not seen the horrors of the Industrial Revolution, then gone on this Grand Tour to learn about art of the past, contemporary landscape art and techniques, immersed himself in the ruins of a past civilization, and then come back and taught all this to his students, particularly Church and [Asher B.] Durand, would there ever have been a national school of landscape art and the so-called ‘Hudson River School’?” I actually question whether that would have come about: his role was so important in imparting all this at the right moment to the young Church, to the mature Durand, and they took it and ran with it. The other thing we learned is that Cole really probably is the first proto-environmental artist in America. It just became a richer and richer story and actually led to my reinterpretation of the right side of the Oxbow. WLC: What has the response been so far? What are your concerns and hopes for the show’s London reception? TB: The [London] reception has been generally favorable, although some critics couldn’t resist saying, with a nationalist sneer, that Cole is not as good a landscape painter as Turner. (No surprise there: Turner is the greatest landscape painter in the entire history of art). The contemporary resonances of the exhibition, barely hinted at in our labels, were very apparent to British reviewers. Of course there is interest in Cole because of his British origins. I have heard a few comments suggesting that we should have included more of Cole’s American precursors such as Alvan Fisher and Thomas Doughty, but I do not think that this would have improved the exhibition since the work of these artists from before 1825 is, frankly, quite dull. BK: I don’t think I’ve given more tours for any show than I’ve given for this one. The demand has been very high. I’ve had a number of college students—they were all male, strangely—ask me about the Luddite rebellion. They are just fascinated by it. I’ve seen any number of young mothers with several children in tow talking about the proto-environmental beliefs of Thomas Cole. They’re either standing in front of The Course of Empire or The Oxbow, telling their children about Cole’s proto-environmental beliefs. Many people just spin around in that long gallery looking at the Turner, looking at The Course of Empire, just blown away by how visually they can see what Cole absorbed and how he re-translates it into his own art. People really get it. WLC: Betsy, reflecting on this experience as the show leaves The Met for London, what advice would you have for Panorama readers who might hope to build projects with a similar broad impact? BK: Well I think that part of it is coming up with a great idea, and oftentimes these ideas are inspired by recent scholarship that is only reaching a tiny scholarly community, but believing that you can take that and expand it out to make a very popular, public exhibition. I have always believed that successful exhibitions that are about lofty ideas are totally dependent on the visual success of the exhibition, of the works you select, not choosing too many. Often retrospectives destroy artists’ careers, more times than not. We deliberately chose not to make this a retrospective. Don’t be afraid to expand beyond just showing American art. If you’re looking at a precedent for an American artist that is a painting by an artist from another country, why not include that in the show? It was shocking for us to realize that in our exhibition, Cole’s works shown alongside those of his British colleagues was the first time that has happened since Cole was in England in 1831 to 1832. In American art, we’ve proven the value. We don’t have to do that anymore with a deeply nationalist story. We can move beyond that and not fear the fact that our artists were inspired by traditions of other nations. Cite this article: William L. Coleman, “An Interview with the Curators of Thomas Cole’s Journey: Atlantic Crossings,” Panorama: Journal of the Association of Historians of American Art 4, no. 2 (Fall 2018), https://doi.org/10.24926/24716839.1658. The London venue of this exhibition, there called Thomas Cole: Eden to Empire, is also reviewed in this issue. Please click here to read the review by David Brody.